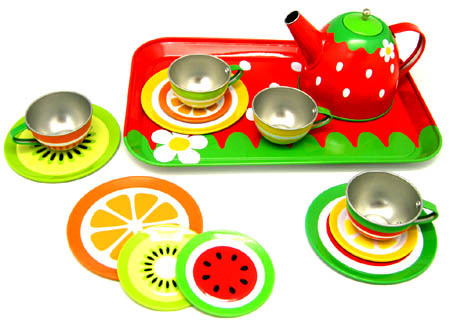 Tin Tea Set Fruit Pattern is a visually delicious creation all ready for a teddy and doll tea party. This tin tea set has 4 place settings consisting of cups saucers and plates. There is a tin tray with a strawberry pattern which compliments the lovely tea pot. This tea set will hold liquid, just be sure to rinse and dry out after use. This set comes in a cardboard display box. We like this because: "Nn old favourite re-imagined in lively fruity colours."